Peachjar’s innovative communication tool recognized by San Diego’s top executives. 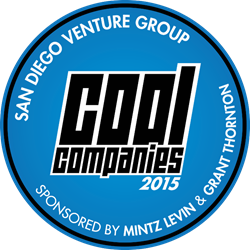 Peachjar, the leading digital flyer management system for schools, was named one of San Diego Venture Group's Cool Companies. The award recognizes growing San Diego technology companies that provide innovative products and services. Peachjar was selected from a group of over 160 candidates. "I've never seen an EdTech company grow so fast," stated Mike Krenn, president of San Diego Venture Group. “Peachjar has a unique solution with enormous potential. They represent San Diego innovation at its best." Peachjar will join other Cool Companies at the Annual Venture Summit where CEO’s will have the opportunity to present to a large group of venture capitalists. Past Cool Companies have included successful ventures such as MOGL, Take Lessons, Embarke and EcoATM.